Amazon has announced the Amazon Fire TV streaming box this afternoon and signals the company's intent to go after the likes of Apple TV, Roku and Google's Chromecast. Stepping up at an event themed around the movies - complete with authentic popcorn smell, Amazon's Peter Larsen outlined the specs and features of the Kindle Fire TV. Encased in a smartphone-alike black chassis, the Fire TV uses a quad-core processor and a dedicated GPU, with 2GB of RAM and dual-band Wi-Fi. 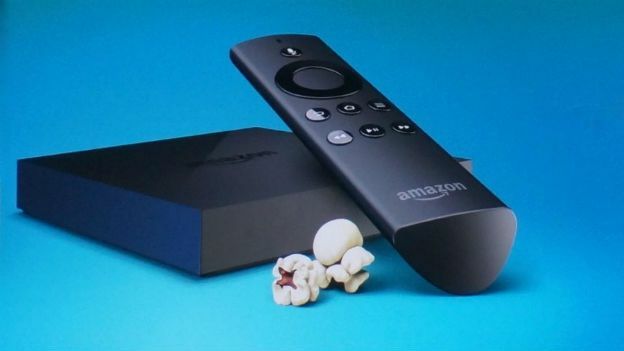 Giving it, Amazon says, three times the speed of Roku, Apple TV and Chromecast. Supporting both 1080p Full HD and Dolby Digital Surround audio out via HDMI, the Fire HD runs on Android and supports all the streaming apps you'll be familiar with. Obviously designed to run primarily with Amazon's own Prime Instant Video service (what used to be Lovefilm Instant), the Fire HD will also let you use YouTube, Spotify, Pandora and even Netflix. The Fire TV will also attempt to help you find things to watch by suggesting movies and shows you might like based on your browsing history. And, if that's not enough, it'll even come with a stylish little black remote that works via Bluetooth. We're not yet sure when the Amazon Fire TV might appear in the UK - and what it'll cost you when it does - but we'll update you as soon as we know more. Watch our video of the Amazon Fire TV below for more details.